Here's something a touch more casual I had on for going for a little shopping with my girlfriend yesterday. A bit more experimental too, but I quite like it. Think I have to get a few more lightweight cardigans. The jacket from my grey suit works quite well alone, even though I don't really like using grey jackets alone (Somehow navy or even brown is always just a lot better as an odd jacket.). 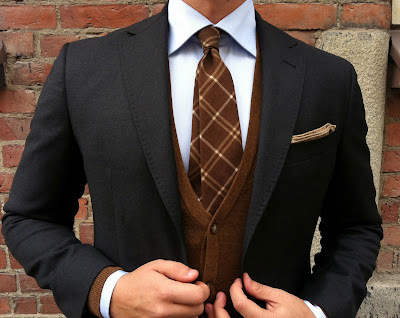 Anyway, here it is with a brown lightweight cardigan, a brown unlined cashmere tie and a light brown with dark brown and blue accents wool pocket square. The trousers are white cotton chinos. 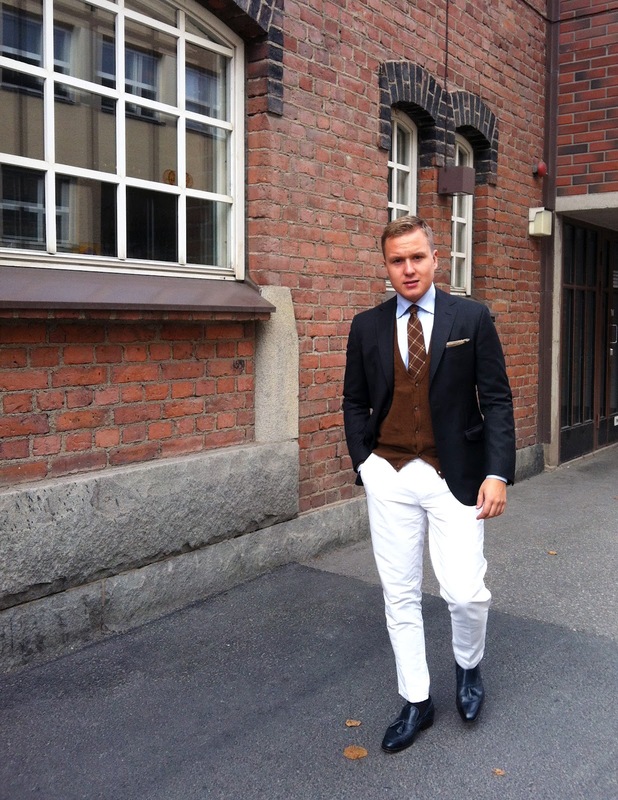 White trousers are so good at highlighting some colors, the browns in this case. 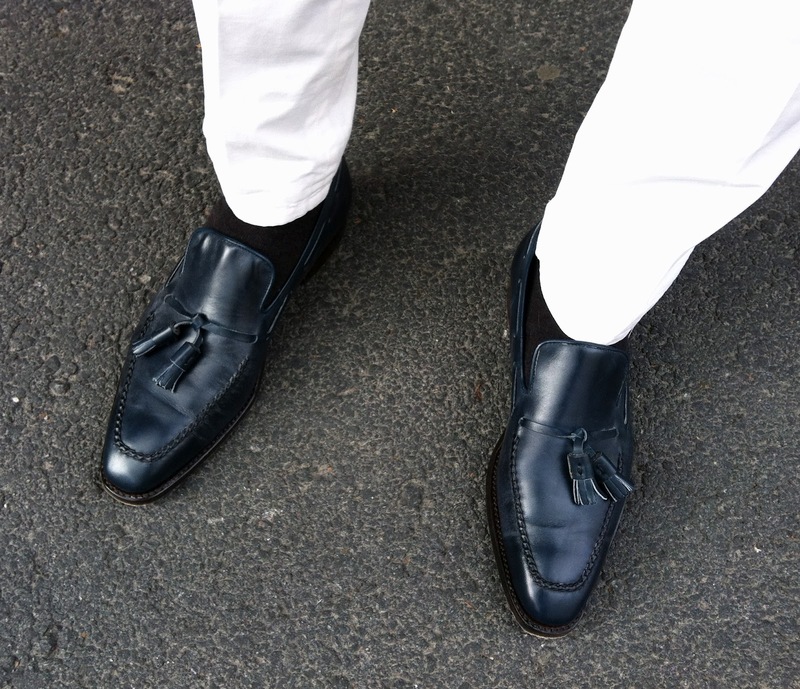 As shoes I decided to pick my navy tassel loafers. In a more sunny day like this I feel they were still a good choice. Shoes are dark brown merino wool. Again, like on FB if you want updates on new posts. A-ha. The Miro is a good looking shoe, but I personally don't like the shape for a penny loafer. It is too much like a square and maybe just a tiny bit too long (for a casual penny loafer). Furthermore, I have to say I'm not that happy with SL's quality. I've only worn these shoes a few times but the leather is wrinkling like it was a 150-200 Euro shoe. If I wanted a penny in this shape I'd definitely look for C&J Mertons that will wipe the floor with these shoes, quality wise. Anyway I agree with you. This is a challenging shape that only really goes with more formal stuff, and it also requires a very slim leg in the trousers. I got them for 40% off the retail but even for that price I think I should've passed (when I think about it now). Sorry to hear about the quality, they seemed like a very ok brand. I have the c&j sydney in suede and shapewise I think they go with anything casual, from sweater and jeans to sportcoat and tie. The miro, like the iconic Berluti it draws the inspiration from are beautiful to look at but hard to match with other stuff. By the way, what's the size of your leg opening where the pant meets the shoe? I'm actually looking for a very similar cardigan. Who's the one you're wearing made by? Hey! This one is from H&M, some 20 Euros or so.